Youth Ministry is an effort by the whole Trinity parish to reach out to youth with the love of God as revealed to us in Jesus Christ through the power of the Holy Spirit. We don’t see our children as the future — they are the present and we are committed to helping them to grow in faith. The entire parish does youth ministry by caring for its young people and welcoming them into every aspect of parish life. 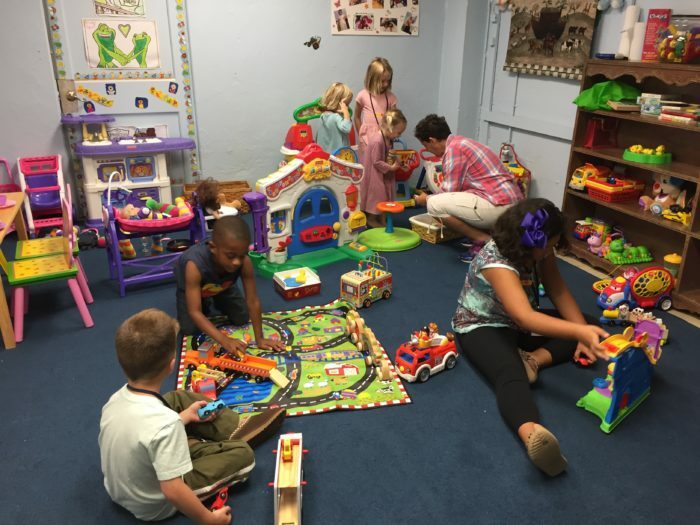 Nursery is provided every Sunday throughout the year for infants and toddlers up though pre-school age. An usher can direct you to our nursery. It is stocked with safe and appropriate toys, puzzles and games. Parents should feel free to come and go as needed. Your children’s safety is our top priority. We always have two excellent, loving caregivers in the room with our children. Our nursery workers are background-checked and there is a camera recording the fun at all times! Our Sunday School class for youth in grades K-5 meets at 10 AM in the School Wing. Each week, our children are presented with an engaging lesson that is reinforced though story-telling, prayer, crafts, and games. Take home papers allow families to continue the discussion throughout the week with suggested family prayers, activities, and community engagement opportunities. We have enthusiastic, loving, creative teachers that work hard to connect the lessons to real life for a better understanding of how God is present in our lives. All youth, from the 2nd to the 12th grade, are invited and encouraged to be servers in worship. As an acolyte, you will be assisting in the leadership of the service. As you light the candles, you are bringing in the light of Christ. As you extinguish the light and carry it forth, you are symbolizing the taking of the light into the world, reminding the congregation that we should always carry the light of Christ with us. Training is held throughout the year. Youth in 6th grade and above are given the opportunity to engage with their faith on a deeper level through the sacrament of Confirmation. Our confirmation program is a two-year process that may lead to the reaffirmation of the promises made for them at the time of baptism and the laying on of hands by a Bishop. Classes are led by the Rector and adult mentors. Included in the program are opportunities for faith discussion, bible study, community volunteerism, faith exploration, and participation in various worship opportunities.